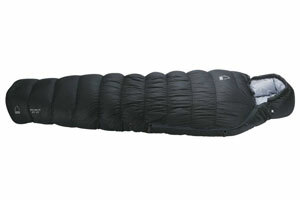 Here's a bargain in the ultralight sleeping bag category that rivals much more expensive bags. The Sierra Designs Nitro, loaded with 800-fill down, does the trick at 2 pounds, 4 ounces for the 15 degree version, and less than 3 pounds for the zero degree. I use both versions, depending on conditions. All ultralight bags are cut closer and smaller to save weight, and the Nitro incorporates a "jacket style" hood as well in an effort to keep ounces to a minimum. 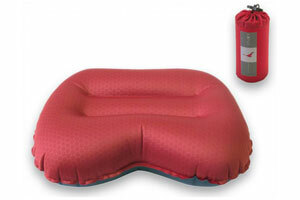 The close cut is an adjustment from traditional mummy bags, but the Nitro works well while being comfortable. The draft tube is generous, the main zipper is on the short side but offset to make entry and exit easier, and the zippered foot box vent gives you ventilation when you need it. Sierra Design builds "Partial Flex" construction into all their Nitro bags, and that gives you a little stretch at the knees and the shoulders while still retaining body heat. After decades of using my sleeping bag stuff sack with jackets and extra clothes crammed inside as my backcountry pillow, this inflatable changed my mind. On two long back country trips this summer, the Exped Air Pillow made my nights much more comfortable. A couple of breaths is all it takes to blow up (I prefer it less than fully inflated), and it fits neatly inside my sleeping bag hood. 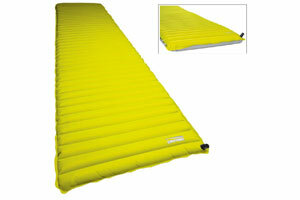 The asymmetrical design means you can use it multiple ways, for slide sleeping or back sleeping. At just three ounces, it extracts a small weight toll but delivers big comfort. For a week long backpacking trip in Yosemite in September, comfortable sleeping was a must, so for the first time in years I left my trusty Therm-a-Rest Prolite at home and took the NeoAir. This thing is a wonder, at under 10 ounces (I use a three-quarter length pad to keep weight down) it provides mind boggling comfort. For side sleepers like me, the NeoAir totally saves your hip bones. I was a little concerned about its ability to withstand puncture, so I selected my tent-sites with care, and thoroughly checked the ground for sharp rocks and other dangerous debris, but in the end had no problems. It takes a minute or so to blow up, and when the air you've put in cools off, you'll need to top it off again before climbing on. I got in the habit of blowing it up when I set up camp, then topping it off with a few breaths before bedtime. The cushion this pad offers is frankly unreal and despite the fact this is an uninsulated pad, it is quite warm even on cold September Sierra nights. © 2019 ClassicHikesofNorthAmerica.com. All Rights Reserved.